Richie and Gloria get married and have a son! Wow, Richie and Gloria grow up and get married, and by grow up, I mean their bodies get very long, yet their heads stay the same; and they have a little “tender”, i.e. wussy child who becomes the next in a long line of Richard Richs. I don’t know that I buy that Gloria would suddenly become such an elitist rich person. She has the most problem of anyone with Richie acting snooty or rich, but I suppose when one becomes a mother, priorities do change. 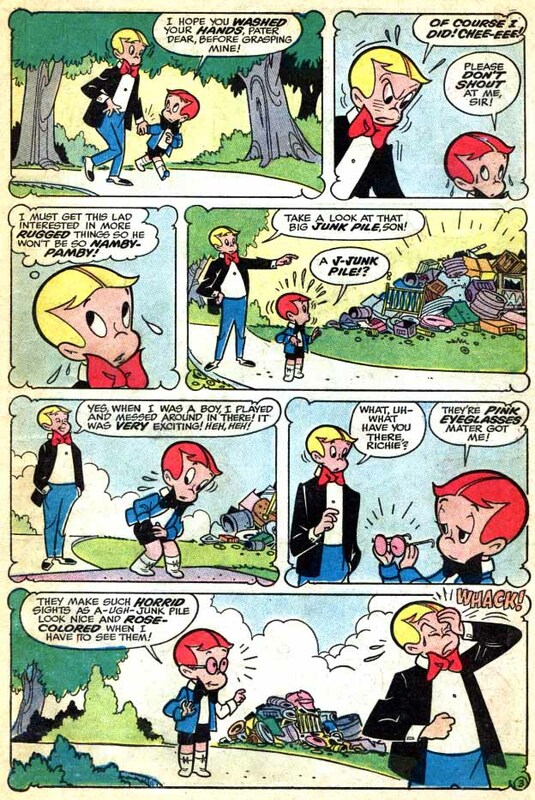 I imagine this Richie would not hang out with Freckles or Peewee’s kids, imagine the germs on them from their hovel! This story definitely provides some Richie food for thought. What did you think? 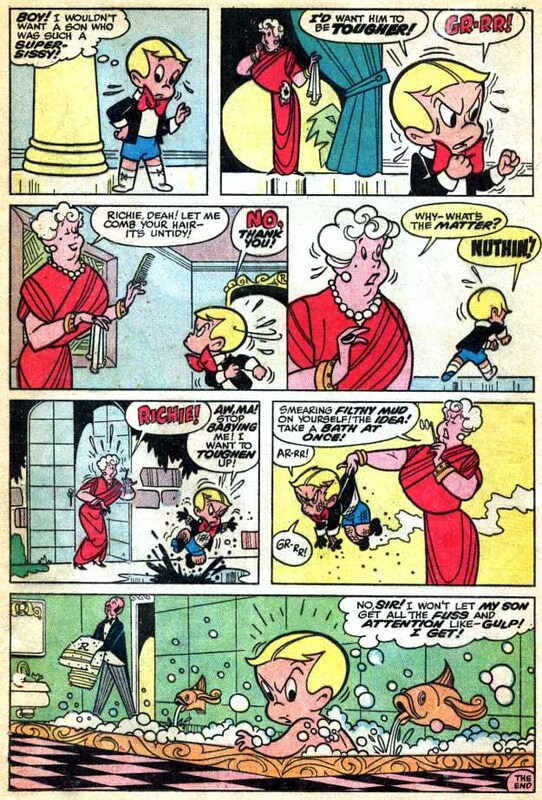 This entry was posted in Uncategorized and tagged Richie Rich #16, Richie Rich and Gloria Glad have a baby, Richie Rich has a son, Richie Rich needs sanitized sidewalks. ← Can you draw Richie? 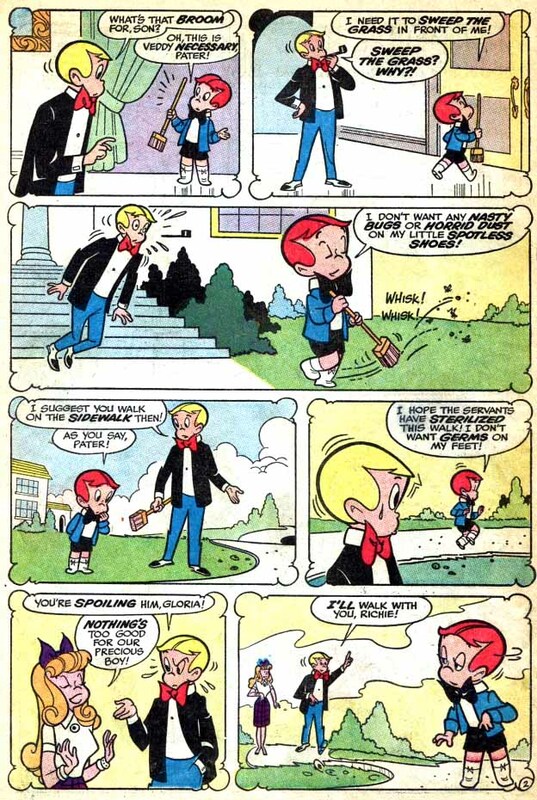 And, travel through an underground tunnel with Freckles and Peewee! I remember this story! 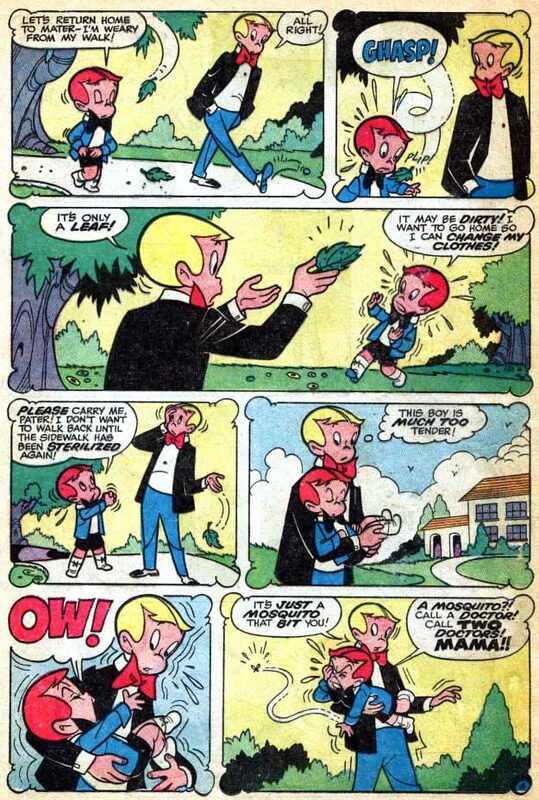 I always thought it was funny how his son ended up like all the other kids at the Snobside school or other places. When I was a kid reading these, I always had the impression from these stories that rich kids were deathly afraid of getting dirty and called their parents Mater and Pater! I noticed that there was a story about Richie wondering if he was poor and Gloria was rich. I would be interested in reading something like that, but I don’t which book it was from. Interesting, that doesn’t ring a bell, but it sounds interesting. This one had a rich Alien Gloria, but compared to Alien Richie, she was still poor. 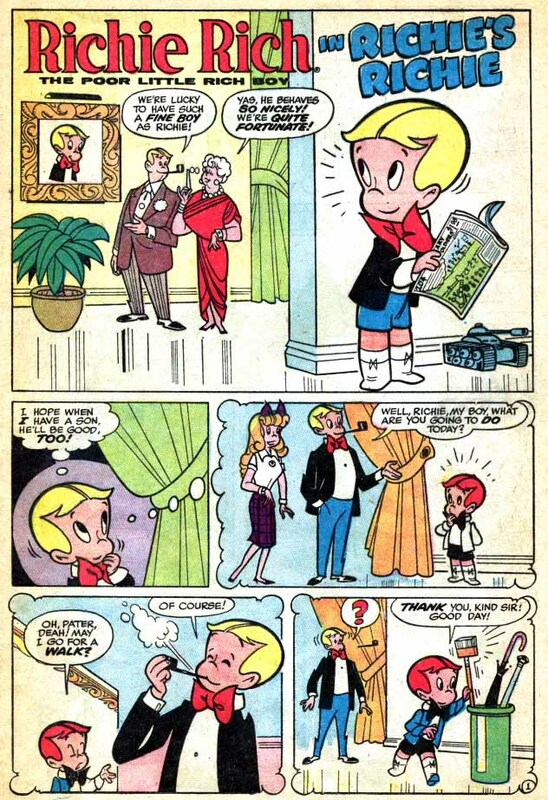 I found the story Hugh mentioned, it is called “Most Precious” and is found in Richie Rich and his best girlfriend Gloria issue number 2.